A gritty culture-clash drama from Robert De Niro's Tribeca Productions, Flawless teamed up De Niro and Philip Seymour Hoffman as, respectively, a retired cop and the drag queen enlisted to help him recover from a debilitating stroke. Typical of the smooth, entertaining pap from Batman Forever/Batman & Robin auteur Joel Schumacher, the 1999 film has gotten a handsome-looking Blu Ray treatment from Olive Films. Flawless is a strange mishmash of a movie, a nominally serious story with two committed lead actors that indulges in uneasy stereotypes with just about every scene. Set in a fake-gritty New York City borough, the story centers upon Walter Koontz (De Niro), a highly decorated retired police officer and middle-aged bachelor who spends much of his free time at the kind of dime-a-dance joint not seen in movies since the heyday of Edward G. Robinson. Despite living in a run-down apartment filled with junkies, untalented musicians and dotty old ladies, he's got it good - hanging around with fellow cop buddies like Tommy (Skip Sudduth) and enjoying a casual relationship with Karen (Wanda De Jesus), a dancer whom he helps support on his modest pension. When a wad of stolen drug money winds up in the possession of one of his neighbors, however, Koontz's attempt at keeping the peace results in a terrible stroke which leaves him partially paralyzed. On his physical therapist's suggestion that taking singing lessons will improve his slurred speech, Koontz approaches the only person he knows who can help. Unfortunately, it's Rusty (Hoffman), a brash drag performer neighbor and the main target for Koontz's homophobic tirades. Needing the extra cash, the caustic, self-loathing Rusty reluctantly agrees to take Koontz on as a student. After a few awkward lessons, the two develop a begrudging respect for each other. The offbeat friendship that grows between the De Niro and Hoffman characters serves as the backbone of Flawless, although the emotional impact of their scenes is dulled with Schumacher's tendency to cram the film with too many ancillary characters and subplots. A good chunk of the story is devoted to the drug dealers attempting to get their stolen money back, scenes that are almost laughable in their cartoonish villainy. Hoffman beautifully conveys Rusty's nurturing personality despite undergoing a lifetime of pain, even though there are moments when it appears more like a skilled actor essaying a challenging role than Hoffman truly inhabiting the man he's playing. De Niro fares even better, so much so that we wondered how this movie would have been if it had focused only on Koontz's recovery, without the drag queen/drug-deal-gone-bad drama. Schumacher's most sensitively written and performed scene had the post-stroke Koontz dealing with a visit from Tia (Daphne Ruben-Vega), a dancer from the tango club who genuinely cares for De Niro, despite his believing that her visit was paid for by his ex-cop buddies. With Flawless latching onto the brief '90s vogue of stories involving glitzy drag performers, having a director like Schumacher who adores flash and artifice seemed like a natural fit. The intimate story shares little in common with escapist fare like The Birdcage and Too Wong Foo, Thanks for Everything, Julie Newmarr, however. For someone like Schumacher who was openly gay and enjoying rare access to mainstream Hollywood, it's disappointing that the gay characters in his screenplay amount to a bunch of screechy drag queens and a few Log Cabin Republicans (another wasted subplot, I'm afraid). He could have said something profound (like what many indie filmmakers did throughout the '90s), but the opportunity was squandered. Note: images are from promotional sources and do not reflect the quality of the Blu Ray under review. Surprisingly enough, the transfer on Olive Films' Flawless comes through looking fabulous in 1080p high-definition. The 35mm film, 1.85:1 picture sports vivid color, lifelike skin tones and lots of excellent detail (best seen on the drag outfits for Hoffman and pals). Darker areas tend to look a little wan, otherwise this disc serves as a good example of the superiority of filmed features over digital (not that I'm complaining - it's just that celluloid has a certain warmth lacking in current films). The DTS Stereo soundtrack is also in clean shape, with no apparent distortion, pops or other signs of age. Dialogue and music is pleasantly mixed at equal levels in this decent, non-showy track. No subtitles or alternate audio is provided. The sole extra is the film's Trailer, which sold it as a simple, somewhat homophobic culture-clash comedy. 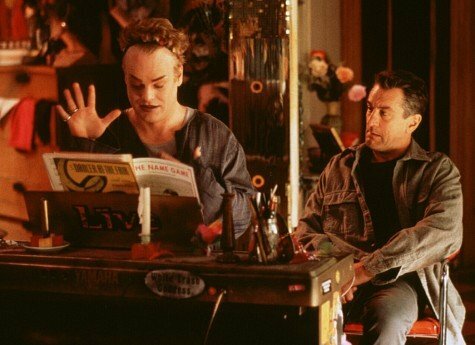 Robert De Niro and Philip Seymour Hoffman remain the best reasons to check out 1999's culture-clash drama Flawless, an otherwise inauthentic, overstuffed cliché-fest from director-screenwriter Joel Schumacher. Olive Films' Blu Ray edition sports a, well, flawless picture for built-in fans; all others would be well-advised to Rent It.